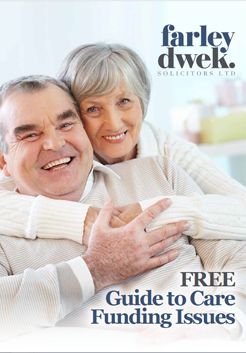 Please complete the form below to download our 30 page Free Guide, or to request a copy in the post. Our Free Guide contains information about what NHS Continuing Healthcare funding is and how it works. It details each step of the process, from the Initial Checklist Assessment right through to Appeals and provides handy tips and real life case studies. We’ve had many people tell us that the Guide helped them through the process to achieve a successful outcome. We hope you will find the Guide useful. By downloading our FREE Guide, you consent to us contacting you solely for the purpose of providing you with further information about our services. We will not use your information for any other purpose and will not pass your information to any third party, but we will contact you about the use of our services from time to time. You will be able to unsubscribe from periodical updates by using the option provided in the Newsletter. Farley Dwek Solicitors Ltd is a firm of solicitors authorised and regulated by the Solicitors Regulation Authority (SRA number 551810). Please note that this Guide ONLY relates to NHS Continuing Healthcare Funding in England and Wales. The funding system and rules in Scotland and Northern Ireland are different and are not covered in this Guide. Unfortunately, we DO NOT provide any services to patients whose care is being funded or provided in Scotland and Northern Ireland.